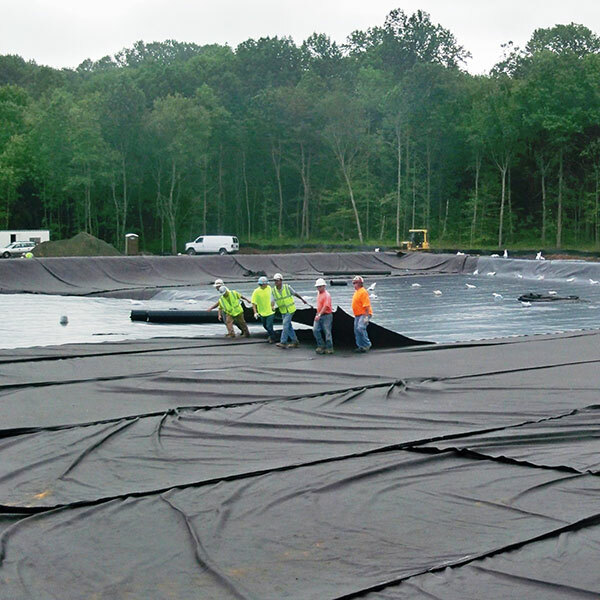 Geomembrane liners are impermeable membranes that are ideal for a variety of primary and secondary containment applications. They are available in a wide range of physical, mechanical and chemical resistance properties. They also offer superior containment and protection for solid waste and water containment, mining, and oil and gas containment applications. In addition, they play a key role in environmental remediation projects. They are a reliable and cost-effective solution to your containment needs. 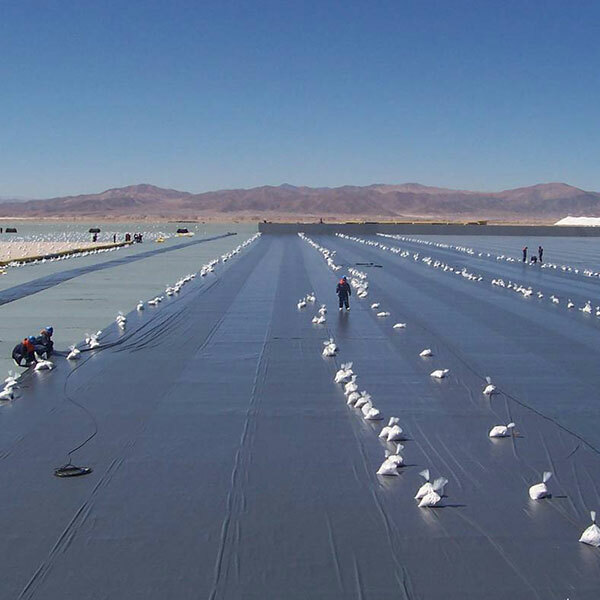 LLDPE is a flexible geomembrane liner that conforms to any surface even in cold temperatures. In addition, it has high elongation, tear resistance and burst strength properties. Also contains carbon black and UV stabilizers to enhance longevity and outdoor performance. Available in 22’ wide roll goods in thicknesses of 20 mils to 120 mils. They can also be smooth or textured on one or both sides to improve friction. Due to its flexibility, LLDPE can be factory fabricated into large panels. Accordion-folding and rolling the panels offers economical deployment in the field. Although weight limits the panel size, we can often fabricate a panel large enough to eliminate the need for field seams. Factory fabrications range from 6 mils to 40 mils in thickness. If the material requires field seaming, certified technicians heat-weld the rolls in the field. This provides a high quality, test certified installation. If you require installation services, please call us at 609-971-8810. We work with a network of experienced and certified geomembrane installers. Rigid tough geomembrane liner that is highly resistant to a wide range of chemicals due to its density. Material also does not require soil cover. It can be left in an exposed environment due to its high UV protection against degrading and low temperature brittleness. HDPE typically delivers to the site in 22’ wide large rolls. They are available in smooth or textured on either one or both sides to improve friction. Available thicknesses range from 20 mils to 120 mils. 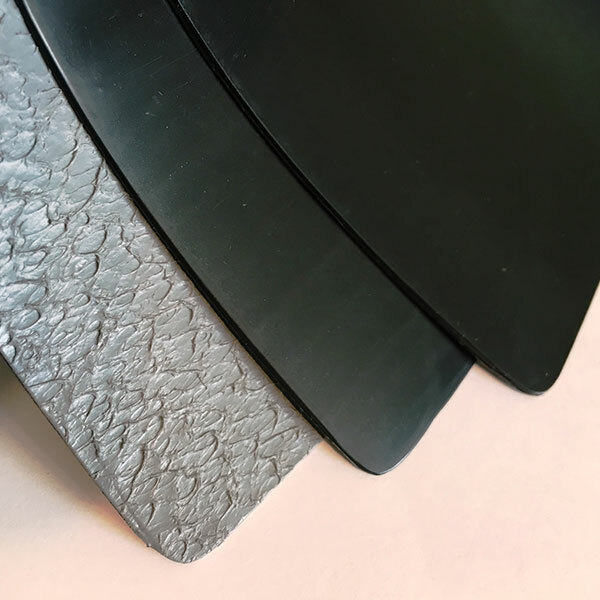 HDPE does not ship in custom panels due to its tendency to develop stress cracks when folded. Certified technicians heat weld the rolls in the field, providing a high quality, test certified installation. If you require installation services, please call us at 609-971-8810. We work with a network of certified geomembrane installers. GCL’s are composite liners that are manufactured by sandwiching thin layers of bentonite clay between two geotextiles. They can also be bonded to a geomembrane to form a very thin, tight hydraulic layer. Needle punching or stitching the bentonite between two geotextiles internally reinforces the bentonite while increasing the shear strength of the material. GCL’s also function as a containment material by forming a hydraulic barrier layer to liquid movement. An experienced, manufacturer-approved certified installer typically performs the installation. The installer overlaps the GCL seams and then seals them with accessory bentonite. Penetrations or repairs also require accessory bentonite. If you require installation services please call us at 609-971-8810. We work with a network of experienced and certified geomembrane installers. PVC geomembrane liners are extremely contractor friendly while offering many advantages over other liners. Highly flexible to easily conform to sub-grade contours. Excellent interface friction properties without being textured. Excellent puncture as well as abrasion resistance. Superior chemical resistance to acids, alkalis, and alcohols. However, covering the material with soil is necessary to protect the liner from exposure to sunlight. It also loses flexibility in cold weather applications. Available in a variety of formulations such as reinforced, potable water, fish grade and oil resistant. Factory fabrications into custom panels in thicknesses ranging from 20 mils to 60 mils are also available. PVC can be self-installed in the field by using PVC glue or solvent. However, critical applications may require heat welding in the field by certified technicians to ensure a high quality, test certified installation. If you require installation services, please call us at 609-971-8810. We work with a network of experienced and certified geomembrane installers. 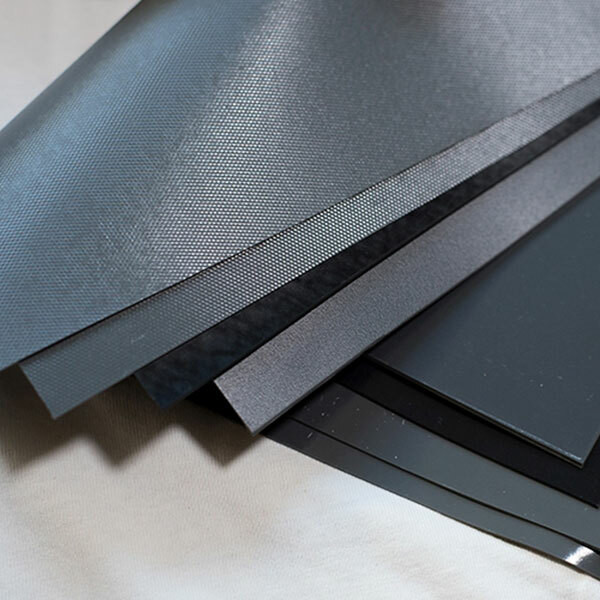 SunTech PVC Geomembrane is designed to be left exposed while maintaining all of the characteristics that make PVC one of the most reliable and easy to install geomembranes available. In addition to meeting the outstanding physical properties of ASTM D7176, it contains a highly engineered UV package. This combination allows SunTech PVC to have a warranty of 10 years or more in exposed applications. PVC Liners are factory fabricated in custom panels that are accordion folded in both directions. Panels are then packaged for shipment to your site for a quick, easy installation to save you time and money. 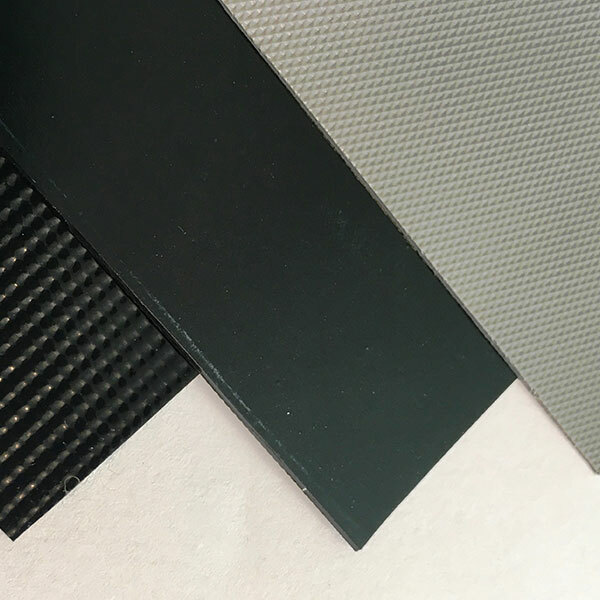 SunTech PVC can be seamed together thermally or with an adhesive making it easy for anyone to use from the most experienced installers to the first time users. 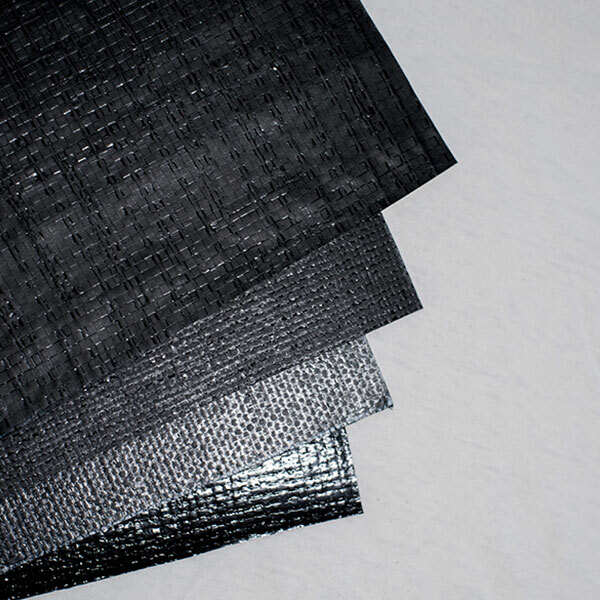 Woven coated reinforced polyethylene geomembrane liners are made by weaving polyethylene tapes and then coating them on both sides with UV resistant polyethylene. 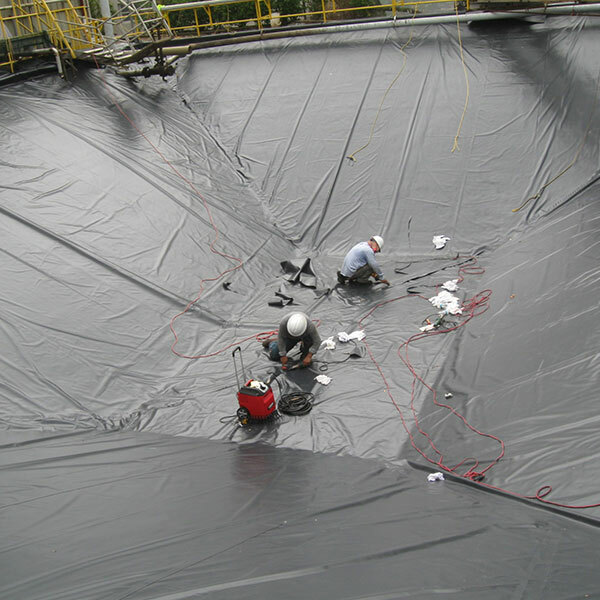 This process produces a lightweight geomembrane material that is highly resistant to punctures and tears. Available thicknesses range 8 mils to 30 mils. Material is available in black, silver, or white. 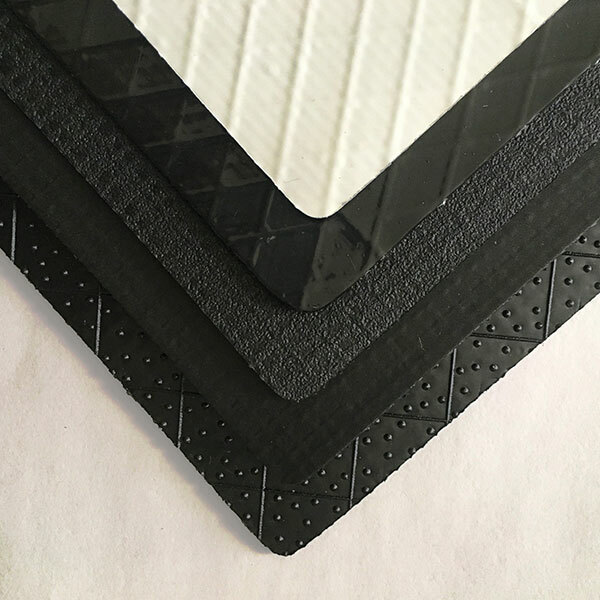 Due to its light weight, woven coated reinforced polyethylene can also be factory fabricated into very large custom panels. Accordion-folding and then rolling onto a core allows for easier handling and time-saving installation. Large panels may eliminate the need for field seaming or sewing. Most often taping is sufficient for temporary or non-critical applications. However, if the material requires field seaming, certified technicians can sew or heat-weld in the field. If you require installation services, please call us at 609-971-8810. We work with a network of experienced and certified geomembrane installers. 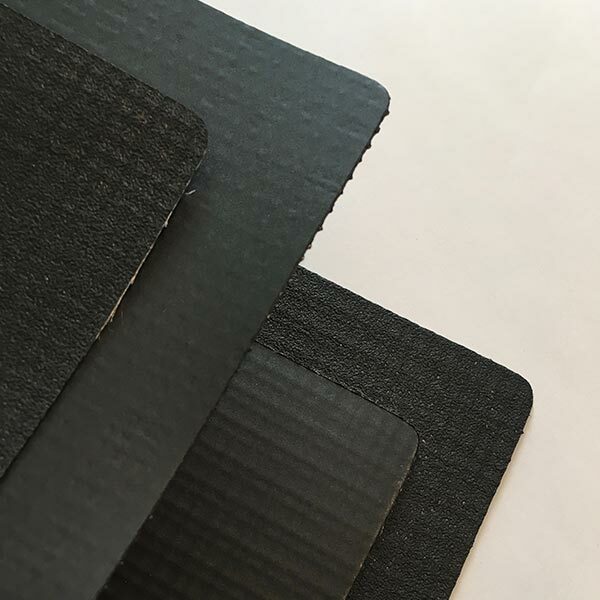 DURA-SKRIM® string reinforced polyethylene geomembrane liners are produced by extrusion laminating multiple layers of high strength polyethylene together with tear resistant polyester scrim. Scrim reinforcement also enhances strength and tear resistance. Excellent longevity in outdoor applications due to UV inhibitors and carbon black content. DURA-SKRIM® K36BT, K40BT and K45BT are unique reinforced geomembranes. In addition, GeoGripTM texturing is available on one or both sides. The GeoGripTM texture provides increased friction between various soil and geosynthetic layers, thus providing a solution for even the most challenging projects. Manufactured in custom factory welded large manageable panels that are accordion-folded and then rolled for economical deployment in the field. Thicknesses range from 6 mils to 45 mils. In addition, the material is available in smooth or textured on one or both sides to improve friction. 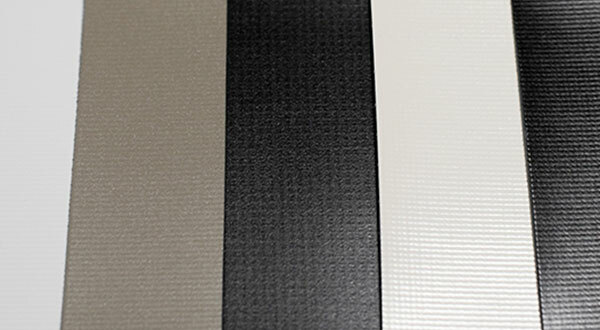 DURA-SKRIM®reinforced polyethylene is available in a variety of colors such as gray, black, white or clear. Large panels may eliminate the need for field seaming. However, if the material requires field seaming certified installation technicians can heat-weld the rolls in the field. If you require installation services, please call us at 609-971-8810. We work with a network of experienced and certified geomembrane installers. Polypropylene is a highly flexible geomembrane with excellent dimensional stability and physical properties. This geomembrane liner does not contain plasticizers that can leach out, so it is approved for potable water applications. In addition, the material is UV stable and does not require cover soil. Polypropylene is available as a reinforced geomembrane or an unreinforced geomembrane. Reinforced PP is available in thicknesses 35, 45, and 60 mil. It can also be factory fabricated into panels up to 25,000 sq. ft. Unreinforced PP is available in thicknesses of 30 and 40 mil and can also be factory fabricated into custom panels. Installation in the field requires heat welding by a trained installer. If you require installation services, please call us at 609-971-8810. We work with a network of experienced and certified geomembrane installers. 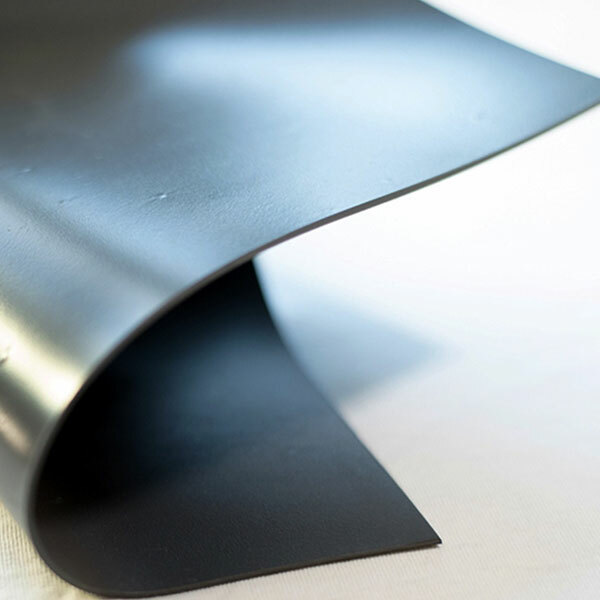 Absolute Barrier™ Y-series is a seven layer co-extruded geomembrane consisting of a flexible, linear low-density polyethylene (LLDPE) and an inner core of chemically resistant EVOH. High strength LLDPE also provides exceptional tear and impact resistance. 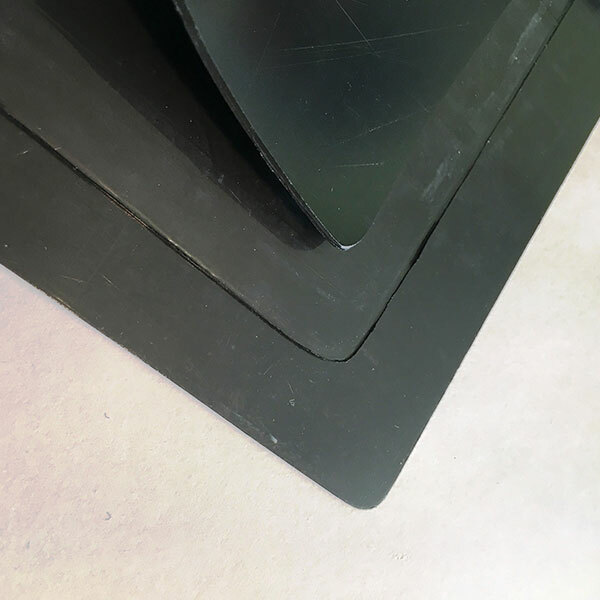 Absolute Barrier® X-Series is a seven-layer co-extruded geomembrane consisting of a durable high-density polyethylene (HDPE) with an inner core of highly effective EVOH barrier resin. It is designed specifically as a barrier against odors, methane, radon, and VOCs. In addition, high strength HDPE provides excellent chemical resistance and durability. The Absolute Barrier™ geomembranes lines are designed specifically to protect against radon, methane and VOCs. A robust stabilization package that exceeds the industry standard, it provides long-term protection against thermal oxidation as well as ultraviolet degradation in exposed applications. Both geomembranes are available in 16’ wide mill rolls or in factory fabricated custom panels that are accordion-folded and then tightly rolled onto a heavy-duty core for ease of handling and time saving installation. Installation in the field requires hot air or wedge welding by a trained installer. If you require installation services, please call us at 609-971-8810. We work with a network of experienced and certified geomembrane installers. Seaman XR-5™ is a flexible reinforced membrane that resists UV degradation, high temperatures, oils, fuels and most harsh chemicals. It is also extremely durable and puncture-resistant. Available in 30 or 40 mil thicknesses and can be factory fabricated into panels up to 15,000 sq. ft. Installation in the field requires either hot air or wedge welding by a trained installer. If you require installation services, please call us at 609-971-8810. We work with a network of experienced and certified geomembrane installers. UltraTech® flexible geomembrane liner is a single-ply EIA (Ethylene Interpolymer Alloy) membrane that offers excellent weather ability and resistance to a wide range of chemicals, oils, and grease. Its high tensile strength, elongation properties, and flexibility over a broad temperature range make UltraTech® an excellent choice for use in a wide variety of applications such as secondary containment, soil remediation, industrial waste, and water features. UltraTech®is also available as a reinforced membrane for more demanding applications. UltraTech Liners are factory fabricated in custom panels that are accordion-folded in both directions for a quick, easy installation to save you time and money on your jobsite. Available in 20, 30, and 40 mil thicknesses. 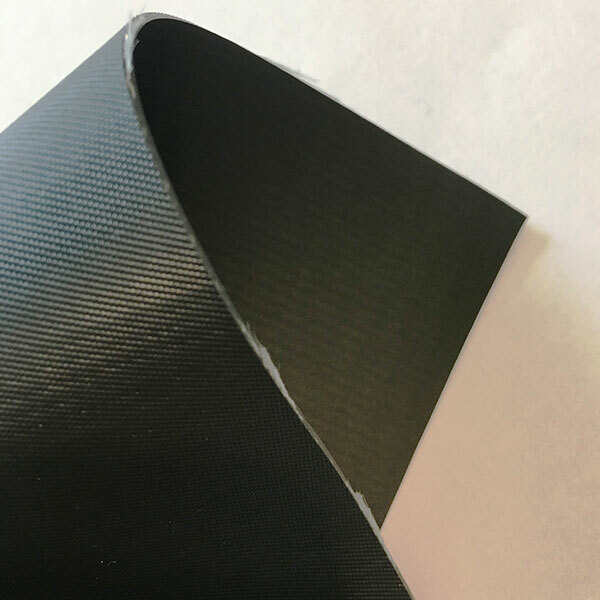 UltraTech® can be welded directly to a PVC liner, allowing the use of PVC on the pond bottom and UltraTech® on the slopes, with no loss of integrity at the connection of the two liners. Installation in the field requires welding by a trained installer. If you require installation services, please call us at 609-971-8810 . We work with a network of experienced and certified geomembrane installers. EPT XTRM PLY® EIA/KEE ​geomembrane products are formulated with enhanced UV protection and are excellent for containing hydrocarbons as well as a wide variety of acids and chemical solutions. This geomembrane liner has achieved some of the highest levels of chemical protection in the primary and secondary containment industry. They are an ideal choice for a geomembrane that is tougher than the elements. 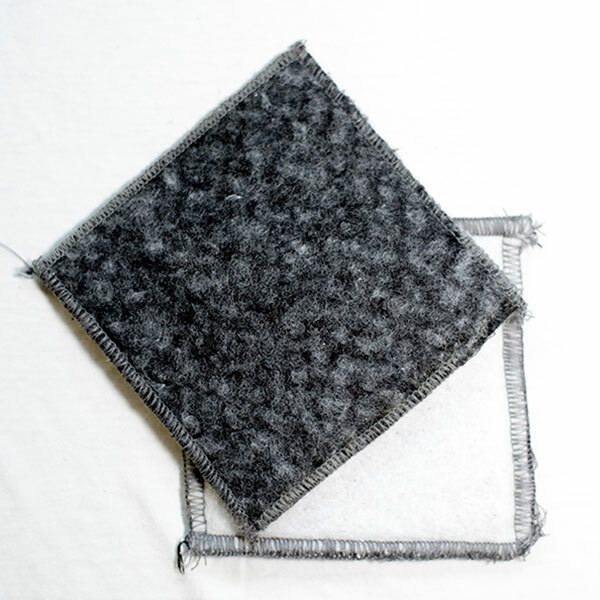 Fabric reinforcement provides improved physical strength characteristics such as high tear properties, extreme puncture, and breaking strength. XTRM Ply EIA/KEE geomembranes are in use in various applications around the world from wastewater lagoons to hazardous waste impoundments. 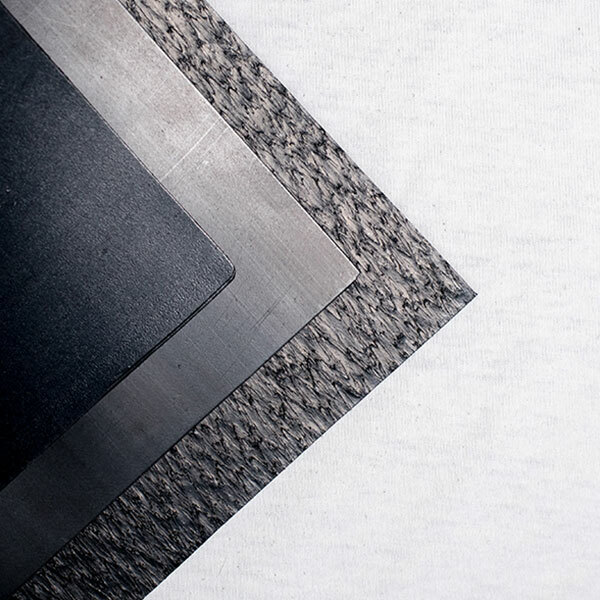 XTRM Ply EIA/KEE products are manufactured in both reinforced composites and unreinforced films. You have the choice of a 1-ply sheet membrane from 20mil to 120mil, a 2-ply that combines a non woven fleece to the back of our sheet membrane, a 3-ply reinforced membrane that offers additional physical strength gained from using an internal fabric reinforcement or a 4-ply product that contains a non woven fleece on the back side of our 3-ply products. 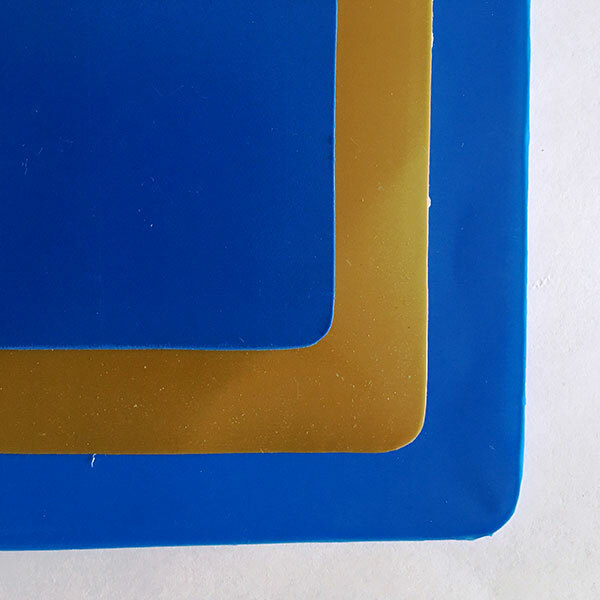 Provided in industry standard thicknesses 30, 36 and 45 mil. Greater thicknesses are available upon request. Installation in the field requires either hot air or wedge welding by a trained installer. If you require installation services, please call us at 609-971-8810 . We work with a network of experienced and certified geomembrane installers. VaporBlock® is a high performance under-slab vapor barrier that retards moisture migration through concrete slabs-on-grade. This product’s state-of-the-art polyethylene resins provide superior physical and performance properties. Additionally, it far exceeds ASTM E-1745 (Plastic Water Vapor Retarders Used in Contact with Soil or Granular Fill Under Concrete Slabs) Class A, B and C requirements. High tensile strength, unequaled puncture resistance, ultra low moisture vapor permeability as well as resistance to decay make VaporBlock® one of the most effective under-slab vapor barriers on the market today! Available in 6, 10 and 15 mil thicknesses to best meet required performance specifications. VaporBlock® 6 and 10 are available in 15’ wide rolls by 200’ long for ease of installation as well as maximum coverage. VaporBlock® 15 is available in 12’ wide rolls by 200’ long. For a superior gas and moisture barrier, VaporBlock Plus® is a 20 mil vapor retarder available in 10′ wide rolls by 150′ long. In addition, other custom sizes are available depending upon size and volume requirements. Folding the rolls and then rolling on heavy-duty cores offers ease of handling and installation. VaporBlock® is overlapped and then sealed with double-sided butyl seal tape. Seams are then covered with single-sided vapor bond tape. Factory fabricated pipe boots in various diameters are also available.